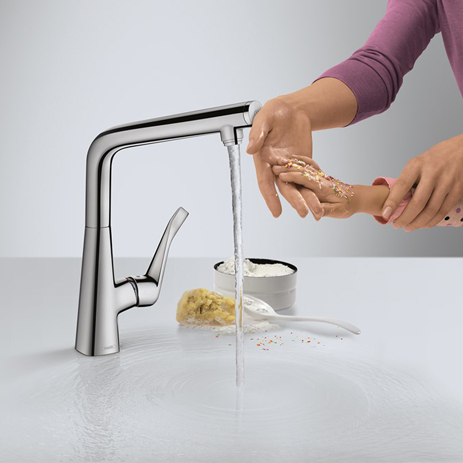 Hansgrohe presents it's ultra-modern kitchen mixers, featuring new design, more flexibility and space so that you can enjoy working at the sink. Choose between chrome and stainless steel - to match the finish colours of your stove, refrigerator or sink. 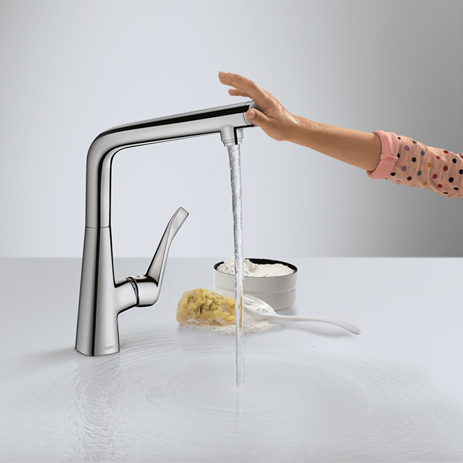 All models blend in really well with the rectangular shape of modern sinks. Our latest kitchen model is called Metris Select. 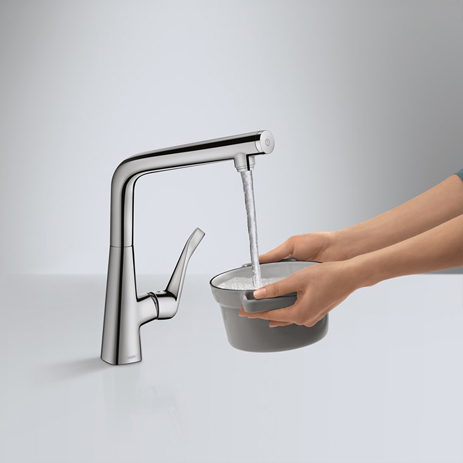 On this mixer the Select button controls the flow of water: press once - water on, press again - water off. 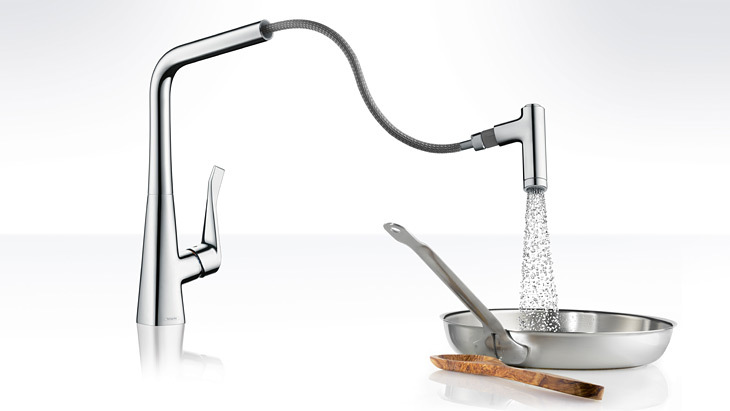 A Hansgrohe concept that will make your work a whole lot easier. Added convenience: you can press the button on the front, even while while you're on the go. Hands full or dirty hands? Simply operate using the back of your hand or your elbow. This keeps your mixer nice and clean. 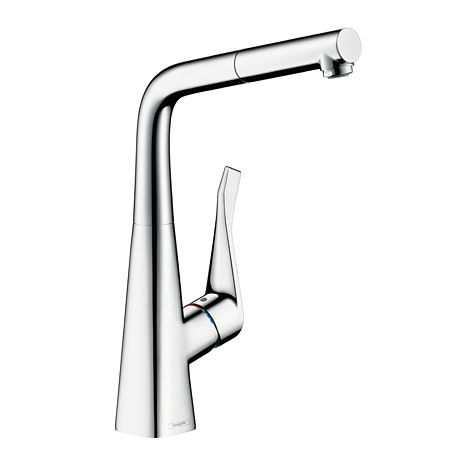 Top functionality: The lever handle remains open, the preset temperature and water volume remain constant. 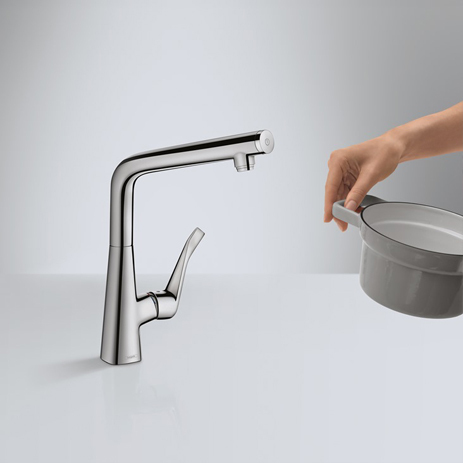 The flow of water is controlled only via the Select button on the mixer spout. 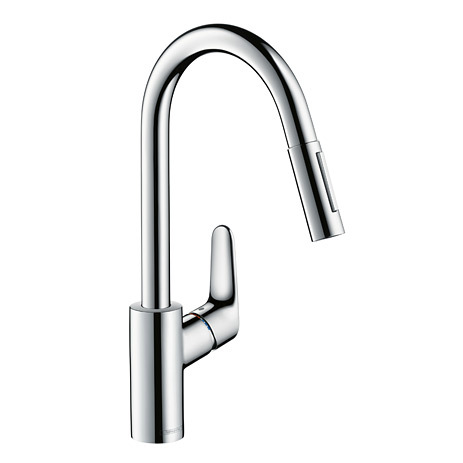 You can adjust the temperature or water volume at any time via the handle. 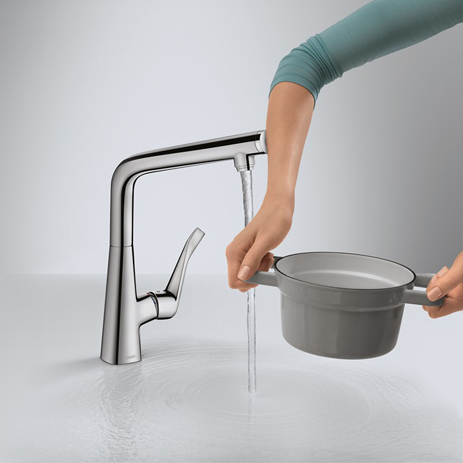 A plus for the environment: conserve resources by repeatedly turning the water off between work procedures. The Select technology is purely mechanical, requiring no electricity or extra equipment. 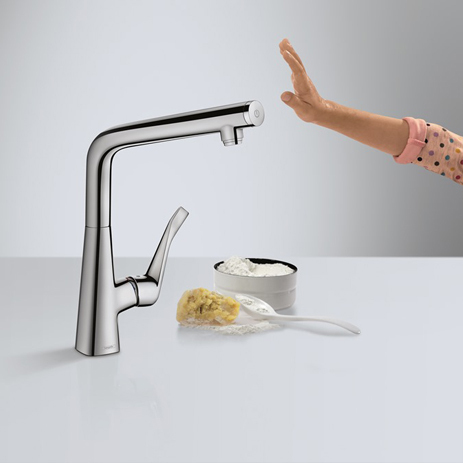 Turn your kitchen into a ComfortZone: with ergonomic handles, individually adjustable swivel ranges, pull-out spouts or hand sprays. 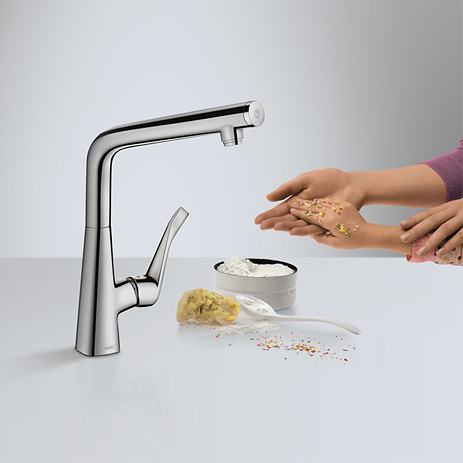 Metris kitchen mixers feature pull-out spray heads, which are easy to grip and pull up from the front. 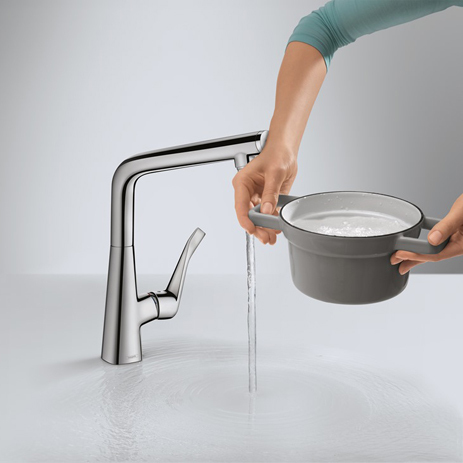 This means that no height is lost, and you can even fill up large vessels really easily. Simply choose between two jet types: normal and shower spray. 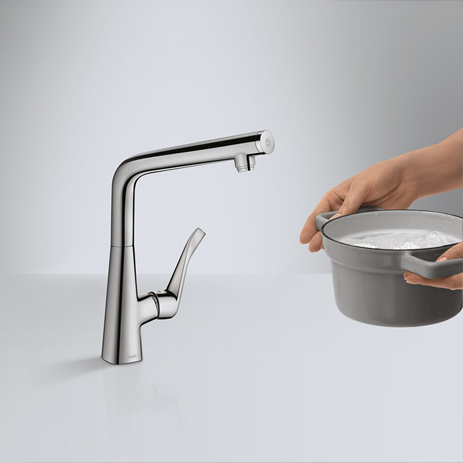 The long handle offers hands, fingers and elbows plenty of surface area, making it easy to turn the mixer off or on, and to set the temperature with precision. 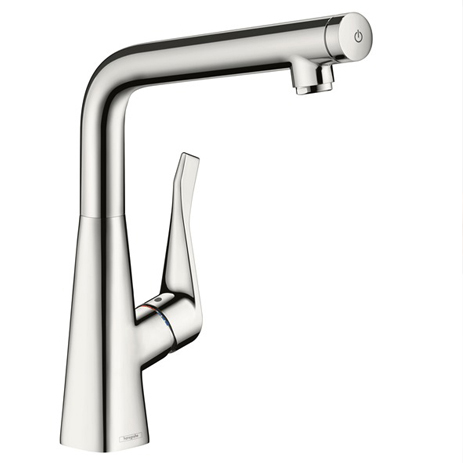 As well as the 2-jet mixer, the Metris range also offers a version with single-jet pull-out spout and a variant with swivel spout. Is your sink in front of a window? We have tiltable variants for this scenario. 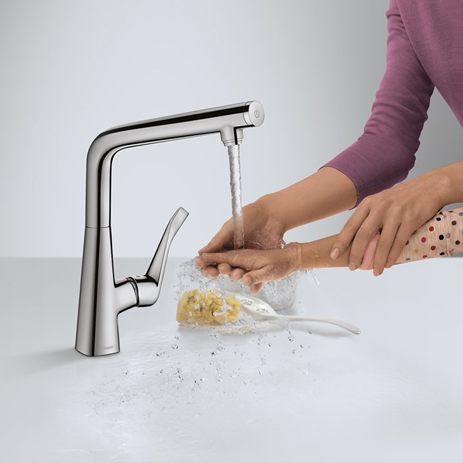 As part of its Focus kitchen mixer range, Hansgrohe is bringing a 2-jet hand spray for price-conscious customers onto the market for the very first time. 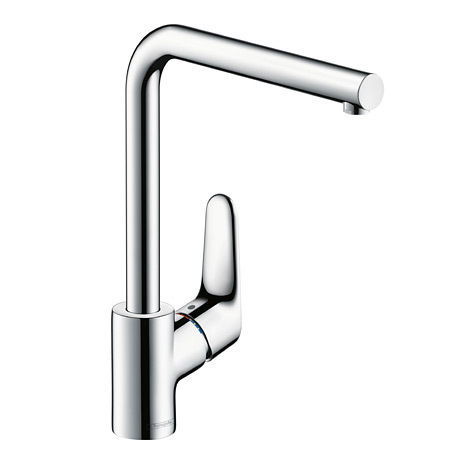 This offers you up to half a metre of elbow room at the sink unit – enabling you to use water with precision. The magnetic holder means that the spray heads can be securely stored away in the mixer shaft after use. This timeless mixer range with a certain panache also offers you the choice of normal or shower spray. 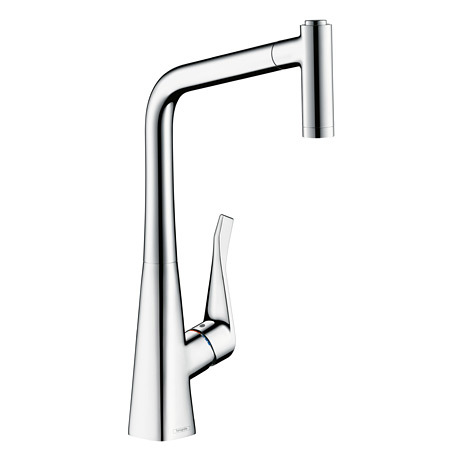 The Focus range includes convenient basic variants as well as high spouts and spouts that can swivel up to 360°.